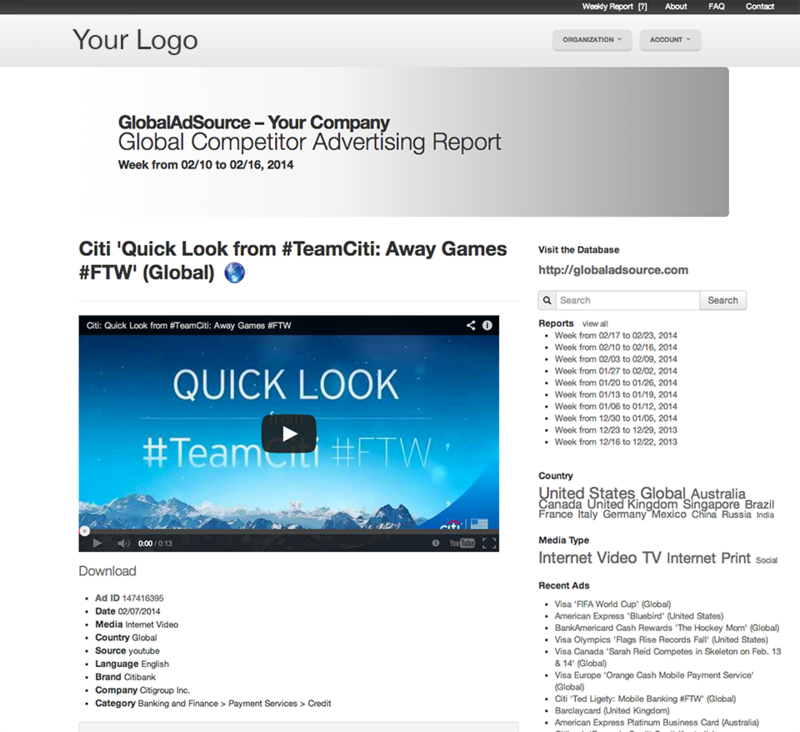 For brand strategy, insight, agency account and consumer insight teams, Global Ad Source offers a custom service. Tailored to meet individual client requirements, the custom service is designed specifically to respond to your brand and market insight needs. 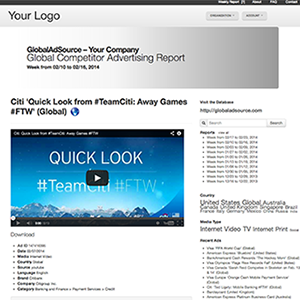 We deliver weekly Activity Reports that alert you to real-time competitor activity and a secure, dedicated online archive resource for search, online view and local download, 24 / 7, anywhere in the world. We track TV, print, radio, outdoor and digital advertising in over 70 markets and, coupled with our unique look at social brand communications on Facebook, Twitter, Instagram, Pinterest and YouTube, custom Global Ad Source is for marketers requiring precise information on competitor marketing communications. Talk to us about your brief, your client, your market, your competitors and we will discuss how our unique global multi-media monitoring can deliver essential insight and help navigate competitor brand strategy. Reports are customized to respond to client brief, delivering updates on new activity matched to key competitor brands, media and priority markets. 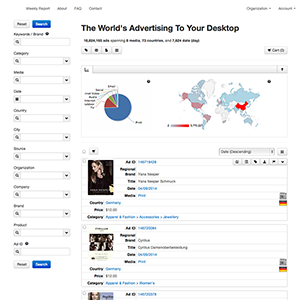 Activity Reports are supported by an online database, which serves marketing teams as a central archive of all new advertising in designated product sectors. The resource features continuous updates of breaking campaigns, intuitive search, online view and local downloading functionality. Our online resource matches the client brief and is customized to reflect their specific category structure. Access is centralized, available anywhere in the world with an internet connection through a single resource. Custom Category Structure - We provide the Company, Brand, and Product architecture you require. Interactive Geographic Visualizations - A map of where new creative has broken based on your search criteria. 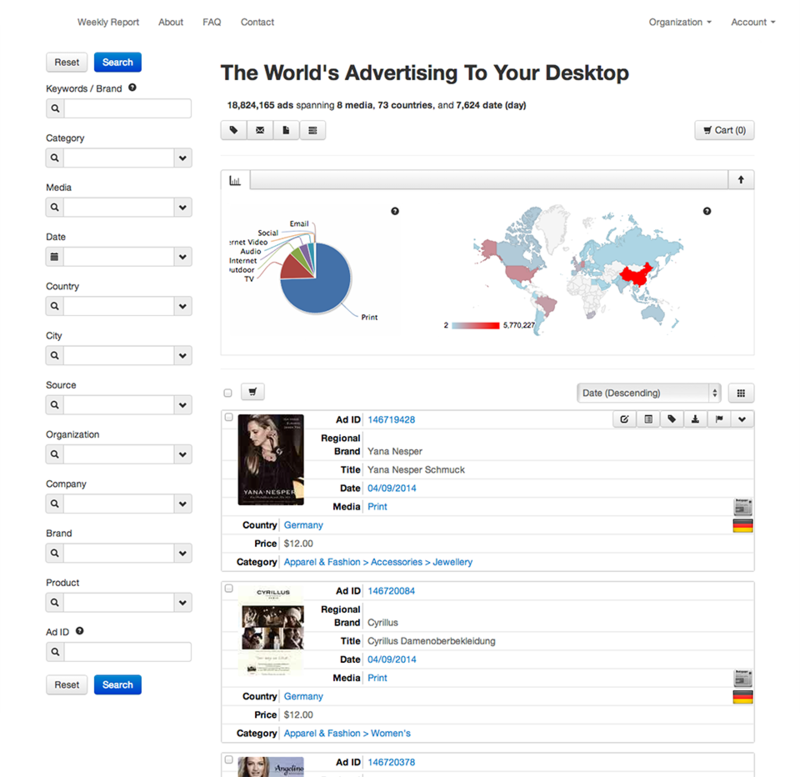 Research and Information Sharing - Create custom teams, add members, share ads and communicate with commentary view.